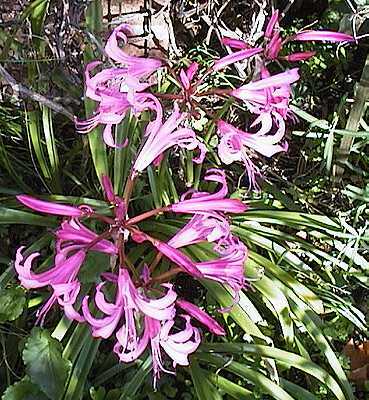 This attractive bulb flowers in the Autumn (this picture was taken on October 18). Although it is said not to be fully hardy, at least in all parts of England, it does not seem to have any problems here in the Cambridge area. The leaves develop in Spring and Summer, and are sometimes gone by the time the flowers appear, although as you can see, they are still very much in evidence on the picture, perhaps due to above average rainfall.